In this tutorial, we introduce the Magento layout by creating a simple module that will add some custom HTML content to the bottom of every customer-facing page, in a non-intrusive manner. In other words, we will do so without actually modifying any Magento templates or core files. This tutorial assumes that you are already familiar with creating your own Magento module, so if you haven’t already done so, I recommend reading our previous article on Creating a Magento Module. The content that is displayed on each Magento page is largely determined by the layout XML files, which can be found in app/design/frontend/base/default/layout. In these XML files, you will see a number of snippets of XML enclosed in layout handle parent nodes, which are used to determine the type of page being displayed. For example, the handle catalog_product_view is used to add content to the product detail page, and checkout_cart_index the basket page. Child nodes are then created inside these layout handles to determine which content should appear on any particular page. These child nodes are called blocks, which may in turn contain child blocks of their own. For example, in a layout XML file for the product page (see app/design/frontend/base/default/layout/catalog.xml), under the catalog_product_view layout handle, we might find a block for displaying the product wrapper template. Then as children of that block, we would find a block for the product image template, a block for displaying the price template and another for displaying the add to basket template. Each of these blocks has a template associated with it. In Model–View–Controller (MVC) terms, the block acts as a mini controller and the template acts as the view. All of the logic for displaying dynamic content is found in the block, which is requested by the template and displayed in HTML form. The Magento layout is quite a complex, yet very powerful, beast, and as a result we will only cover the parts that are relevant to this tutorial. There is a layout handle named default which is included on every page, and since we want our module’s HTML content to appear at the bottom of every page, this is the layout handle we will use. Now those of you who have a little Magento experience, or have read any more noteworthy Magento tutorials, may be gasping at the fact we are making changes in base/default since this is where Magento core files are located. However, we are not modifying any files here, we are creating new ones, and furthermore we are prefixing our file name with “smashingmagazine,” so there is very little chance of this conflicting with other modules or causing any issues with upgrading Magento in the future. Here we have referenced an existing block, before_body_end, in order to add our own block, smashingmagazine_layout_footer, as its child. before_body_end is the name of a block that has its content output just before the </body> tag of the page HTML. You can find the definition of this parent block by looking in app/design/frontend/base/default/layout/page.xml, and the content of this block is output in the .phtml templates within app/design/frontend/base/default/template/page. Now it’s time to take a look at the front end. Upon viewing any customer-facing Magento page, you should see an image displayed at the bottom, and upon viewing the source of the page, you will see it has been included just before the <body/> tag. Now we want to tie in some simple logic to our template. The source of the image in our template includes a parameter “date” which currently contains a static value of “YYYY-MM-DD.” We want to be able to dynamically populate this parameter with the current date, for which we require some logic from our associated block. At the moment, our template is associated with the default block type core/template, which only allows us some basic abstract block functionality. Therefore we must create our own custom block. Try experimenting by changing the layout handle from default to catalog_product_view or cms_index_index to see the HTML content appear only on the product page or the homepage respectively. You can also try changing the location the content appears in our page’s HTML by modifying the parent block from body_before_end to after_body_start or content. This is a very simple example aimed at showing you the basics of how to make use of the Magento layout without needing to modify existing templates, which would potentially cause you problems when upgrading your Magento instance. Using the techniques outlined in this tutorial, you could easily add something like Google Analytics tracking to every page, without needing to modify a single line in Magento’s core templates. What’s more, if you no longer wanted the custom HTML content on your website, you could simply disable the module and hey presto, it’s gone! Feel free to view or download the source code (Github). 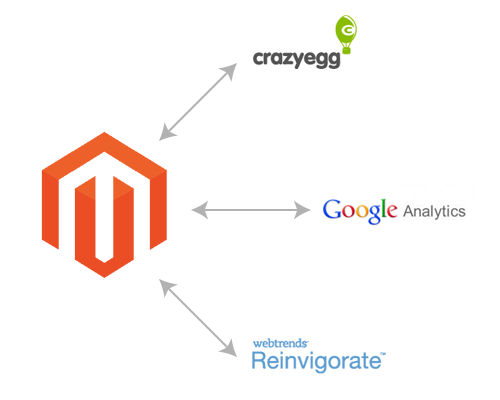 Now that we are all experts on the Magento layout, here are some very simple examples which follow the very same pattern, but demonstrate how easy it is to integrate third party software with Magento. Since all of the information you need is detailed in the above article, I will provide some pointers on how you should approach each integration. Magento actually ships with Google Analytics, so it is in fact as simple as entering your tracking code in the admin panel; however, this does not make it any less useful as a try-it-yourself example. The first step is to visit the Google website to retrieve the snippet of code that you need to include on your website. You will notice the only dynamic element of the standard tracking code is the account number (e.g. UA-12345678-90), so for the purpose of this example I would suggest making this number the dynamic content to be retrieved from the block. In a future article, we will cover the topic of making this kind of content admin panel configurable, so abstracting it to the block for now makes good sense should you wish to revisit this example. Now on to creating your module. I would suggest keeping the same namespace for all of these examples, “SmashingMagazine,” and a fitting module name would be “GoogleAnalytics” in this case. You will need all of the elements of the main article above, so make your way through the article once more, adjusting as required. Since you want your code to appear on every page, you should now know the best layout handle to choose. If you encounter any problems, check and double check that you have followed the main article exactly, as most beginner issues with Magento are typos and syntax-related mistakes. You should now see a pattern emerging! You can simply follow exactly the same steps again to integrate other popular third-party software with your Magento website, all without modifying a single core Magento file or having to copy and paste content directly into the admin panel, where somebody could accidentally delete it one day. I welcome any questions and would love to hear any feedback in the comments area below.